DAVOS, Switzerland (Reuters): Turkey’s economic growth has softened but government moves to cut tax and accelerate the transfer of billions of lira to the Treasury mean Ankara currently sees no recession or negative growth, Finance Minister Berat Albayrak said. After years of strong growth, fuelled by break-neck construction projects and cheap loans, Turkey’s economic growth slowed sharply in the third quarter of last year to 1.6%. A Reuters poll last week found that it has started contracting and will not grow again until the second half of this year. The slowdown has underscored the serious damage caused by a currency crisis last year when the lira lost 30% against the dollar, driving inflation up to 25% and forcing the Central Bank to hike interest rates drastically. 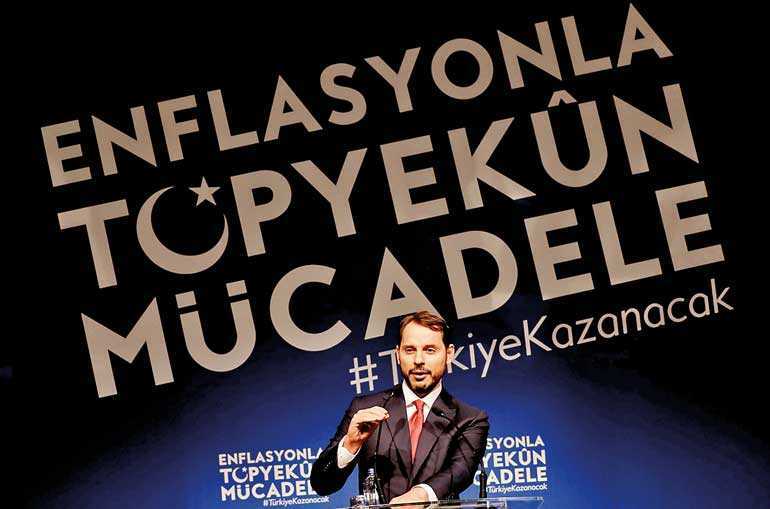 Albayrak predicted the slowdown would be less serious than economists believe. Growth will bounce back strongly and the government’s overall 2019 growth target of 2.3% was still in reach. “Currently we don’t see any recession, there is no minus growth,” Albayrak said on the sidelines of the World Economic Forum in the Swiss ski resort of Davos. Turkey announced several measures in the last four months to soften the economic slowdown, including a temporary lifting of taxes on purchase of cars and white goods and an early transfer of 37 billion lira of Central Bank profits to the Treasury. It also hiked the minimum wage by a quarter and rolled out a $3.7 billion loan package for small businesses two weeks ago. “The necessary actions that we have taken so far, starting from late October...definitely has a significant effect,” Albayrak said. The wage rise would have only a muted impact on inflation and was not a sign that President Tayyip Erdogan’s government, which could lose control of some large Turkish cities in March local elections, was loosening purse strings.“When it comes to fiscal slippage ... it is not going to happen,” he said. Albayrak’s appointment last July alarmed investors who feared it signalled that Erdogan, his father-in-law, was seeking tighter control of monetary policy. Erdogan has frequently criticised high interest rates, blaming them for inflation. The minister said he had always insisted that interest rates were the central bank’s business, not his. Last year’s meltdown in the lira was exacerbated by tensions with the United States centred on the two-year detention of an American pastor in Turkey. US President Donald Trump imposed extra tariffs on Turkey metal exports and briefly sanctioned two Turkish ministers. Washington’s renewed sanctions on Iran could also test relations again with Turkey, a major importer of Tehran’s gas. But, pointing to a temporary waiver for Turkey’s gas imports, Albayrak said Ankara had no immediate plans to cut Iranian imports, although it aimed to reduce dependency on energy imports in the longer term. He also played down a tweet from Trump last week that Turkey could face economic devastation if it attacked the US-backed Kurdish YPG militia in northeast Syria once US troops pull out.